One of the hallmarks of Modern painting has been the distinctive shift from the primacy of narrative towards an exploration of the medium of paint itself, so that a painting is concerned only superficially with its subject, but much more profoundly with ideas about light, colour, space, shape and design. This is not to say that the artist is unmoved by, or disengaged with, the subject, but simply that through exploring the abstract qualities mentioned above a much deeper resonance is revealed. In the hands of a good painter, a landscape painting can evoke many mysteries, can be spiritual or earthy, intimate or expansive, triumphant or melancholic. During this course we will consider the very different ways in which a subject can be treated and how to express varied mood and feeling. We will discuss the role of colour in expressing these themes, and the importance of subject selection and simplification in endeavouring to achieve an overall sense of unity and design. Students will be encouraged to develop a personal response to the landscape, and to find their own voice in expressing their ideas. The 5 day course in Suffolk will be held at Berghersh Place, a delightful country house with beautiful gardens and a newly built studio. 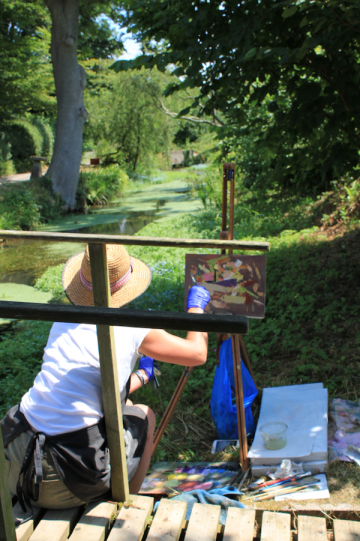 We will be focusing on painting out of doors in the Suffolk landscape, both by the sea, and in and around the gardens at Berghersh. The course is non-residential, but will include lunch and refreshments every day. Hugo lived in Suffolk for 15 years, and is passionate about its huge skies and inimitable quality of light.